Ceremony arbours and features, bridal table and photobooth backdrops … these items can be used throughout your wedding to draw the eye and add a feature. As always, feel free to contact us for customised options or any questions you might have. Driftwood arbour – built on the frame of our simple wood arbour, this involves individually tying pieces of driftwood on to achieve this look (DIY not recommended). White draping optional. Mesh Backdrop – spikes into ground. Approx 1m wide by 1.6m high. 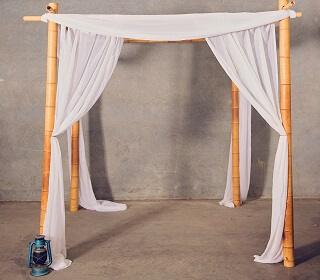 Simple three piece wooden arbour: fabric draping in white or tri-colour optional. Curtains in plain white or lace available as well as other backdrop options on request. Vintage wooden fireplace – for ceremony altar – fresh flowers POA. Freestanding.